Although I'm not a big fan of gum in general, I love the bright colors of a gumball machine, and my kids always get excited about candy. So I decided to do a gumball/candy theme for our letter G unit. Confessions of a Homeschooler has some cute free G is for Gumball printables that we used as we learned the letter this week. Also, my middle child's name starts with "G," so he was very excited to have a letter of the week that related to him. I printed out his picture and name that both boys practiced tracing. It was hard to find books that were just about "gumballs," but we enjoyed some picture books about various forms of "junk food." This book featured a goat named Gregory, so we were able to reinforce the letter "g" sound while we talked about a different kind of "junk food." 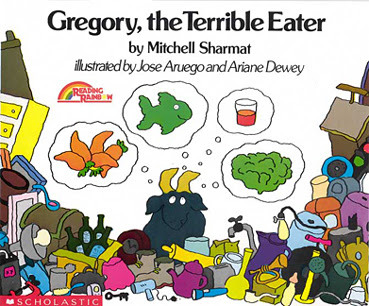 My kids loved how everything was backwards in this book--he was a "terrible" eater for wanting vegetables. After we read this, they wanted to pretend to be goats and eat pants. So we had some good laughs as my kids crawled around with pants in their mouths. In this book, the narrator gives clues about a mysterious object, and people take turns guessing what the item is that is "round like a ball." One of the guesses is a gumball machine. My kids loved the guessing game and the fun illustrations with cut-outs. 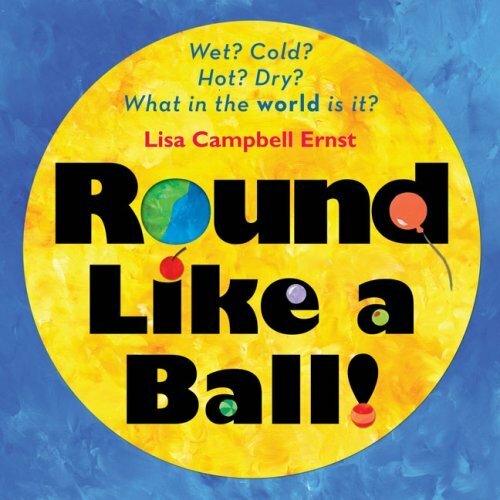 In the end, the round item is the Earth, so this would also be a great book pick for Earth Day. My kids love the Berenstain Bears. We've read almost every Berenstain Bear book written. 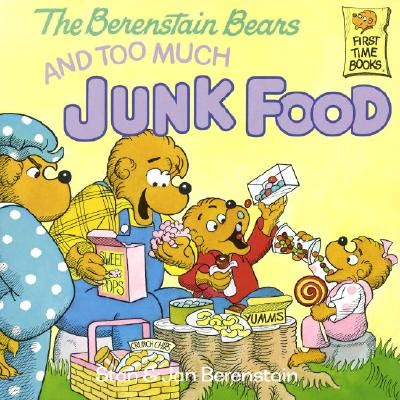 In this book the bear family learns to improve their eating habits and get back in shape. 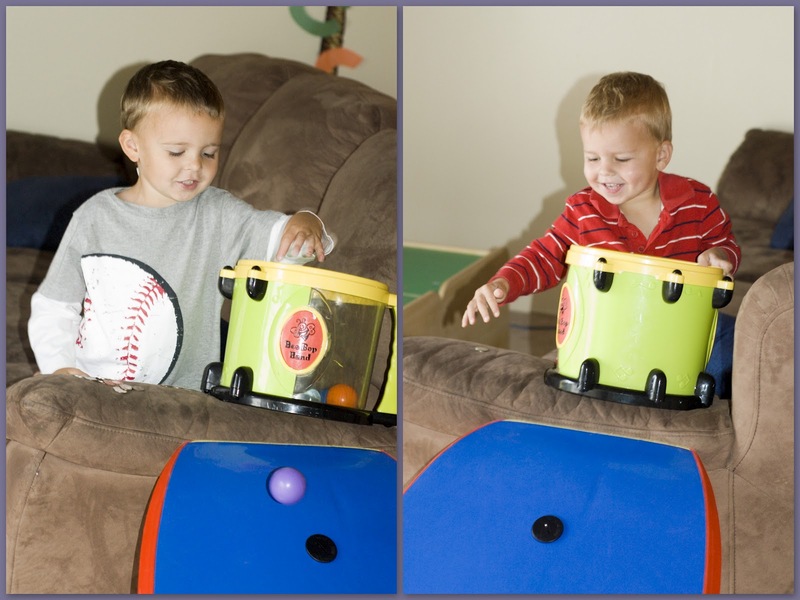 I was inspired by this post to create our own pretend gumball machine. 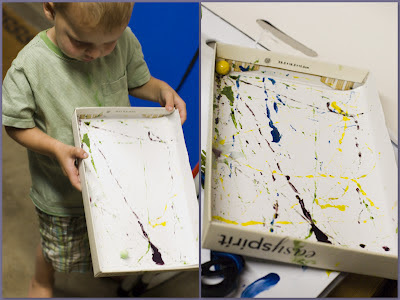 We did this by propping up one of our boogie boards against the couch and using a large clear bucket filled with colorful balls as our machine. The kids took turns operating the machine. One child would hand the other coins (I just gave them a small bowl with a mix of coins). Then the machine operator would count the coins and send down the appropriate number of gumballs--one for each coin. They didn't worry about coin value--they just sent down one ball per coin no matter what type of coin was given. It was a great way to practice counting and have some fun pretend play at the same time. I found a great website with candy science experiments just a little too late for our gumball unit--but next time, I will definitely be trying some of those experiments. We did enjoy watching the bubble gum episode from Discovery Channel's How It's Made. My kids (and my husband) love that show! I'm not a big gum chewer, but after watching that show I never wanted to chew pink bubble gum again! I love this great "backyard art" project with a gumball machine. I showed my kids "Three Machines" by Wayne Thiebaud and we talked about color. We read the book Mouse Paint and learned about the three primary colors--red, yellow, and blue. 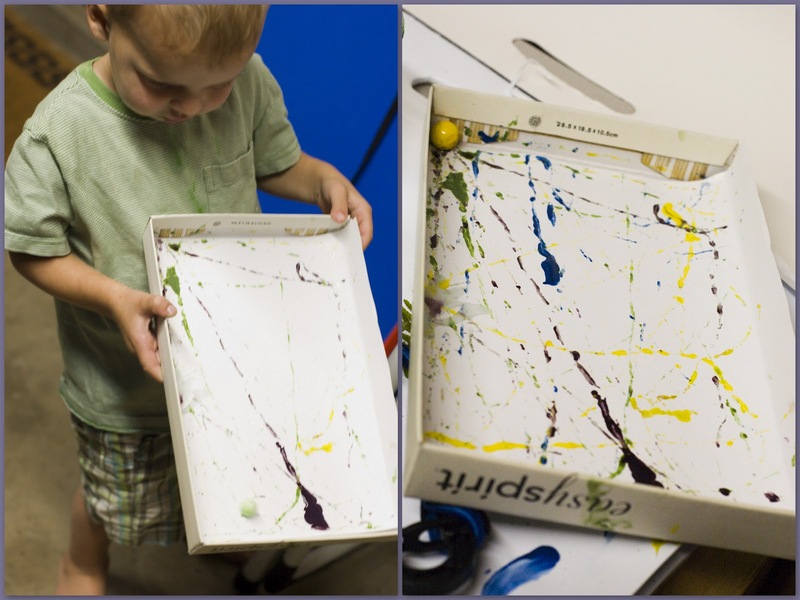 We used construction paper in the primary colors for our gumball machine craft, and we practiced mixing colors when we did gumball painting in a shoebox lid (see below). We made our own paper gumball machines out of construction paper and pom-poms. My older son glued actual gumballs instead of pom-poms. This worked for me--the more he glued on the craft, the fewer gumballs that he was going to end up eating! 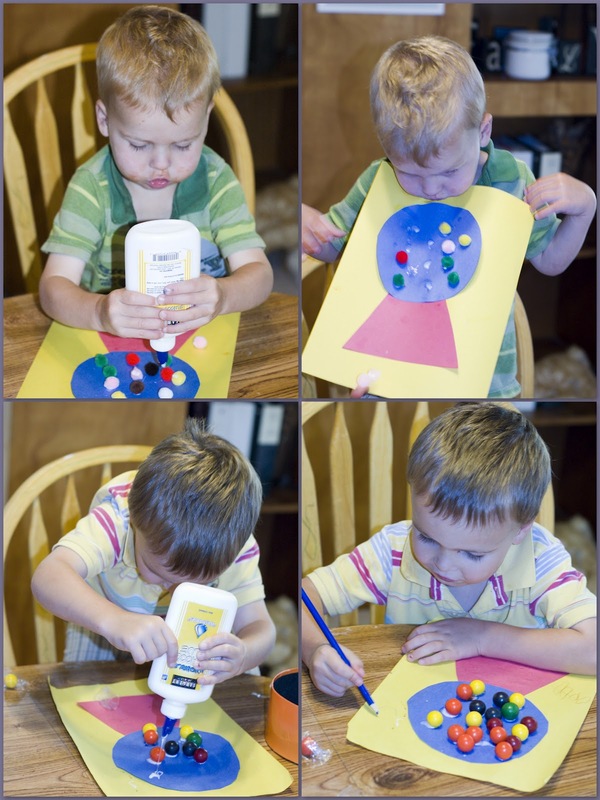 We also had a lot of fun painting with gumballs. I put a piece of paper inside a shoebox lid. Then, I let my kids each choose a gumball and a color of paint. They rolled the gumball in paint and then put it in the shoebox lid and tilted the lid to let the painted gumball roll all over the paper in unique designs. Though we had a lot of fun with our gumball-themed activities, I wasn't a big fan of toddlers + gum, so instead of having gumballs for a snack, we made gumball machine cupcakes with m & m's. 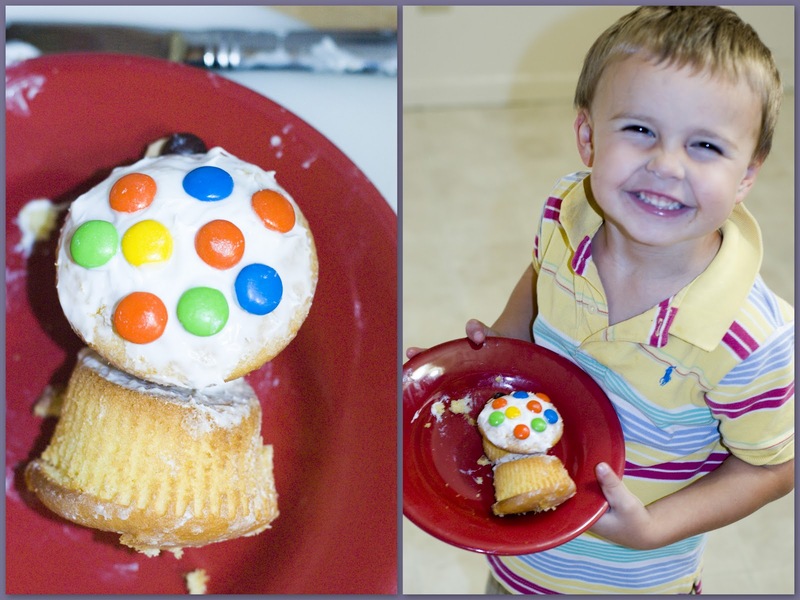 I saw this tutorial for these cute cupcakes, and I made a simplified version of them. My kids were thrilled with these. 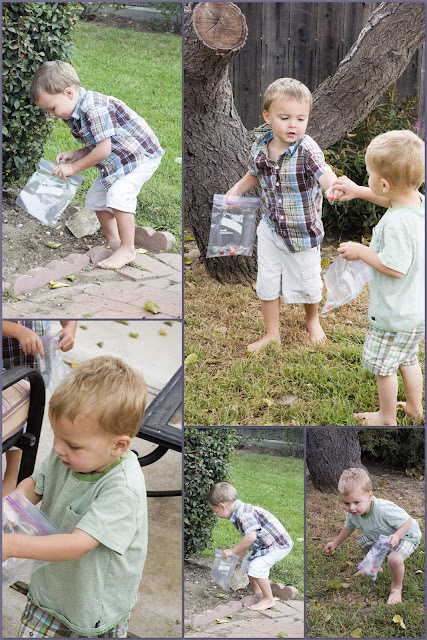 At the beginning of the unit, we went on a hunt around our yard for "gumballs." I found some that were individually wrapped in plastic so that they didn't get dirty. My kids loved going on this gumball hunt! We also loved playing the classic Candyland game. My kids never seem to have the attention span to finish the whole game, but we still have fun starting this game. We have a little ritual--we always have to read the story on the box first. Then, the kids enjoy picking cards and marching their little gingerbread men around the board. They are always so excited when they have a "double" color or a character card. I have to admit that I stack the deck sometimes to move the game along. It's hard to find songs just about gumballs, but there are quite a few that feature candy. One that my kids always love singing is, "If All the Raindrops Were Lemon drops and Gumdrops." Others that we also sang/listened to included "On the Good Ship Lollipop" and "The Big Rock Candy Mountain." For more G is for Gumball ideas, check out my board on Pinterest. Also, be sure to check out this cute gumball machine costume and gumball Valentine box that Andrea posted earlier. Wow ! That was a great lesson plan! I'm in awe... and I miss you ! We need to hang out again! I wanted to come by so badly yesterday but Kiera fell asleep right on the way.. so I thought it would be better for her to get her rest!